This year the city of Melbourne witnessed an incredible array of exciting events to conclude World Refugee Week on 24th June 2017. The festivity was hosted by various refugee organisations to welcome people from refugee communities to celebrate the diversity in Australia. The Asylum Seeker Resource Centre (ASRC) Business Connect Event is one of its kind coinciding with this year’s Refugee Week. The event featured inspirational guest speakers offering insights on entrepreneurship in Australia and networking opportunities for aspiring entrepreneurs, educators, mentors, funders and other business people in the community. 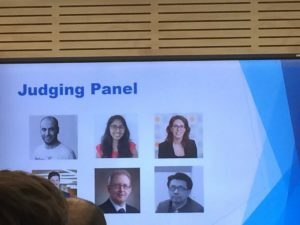 Nirary Dacho, CTO of Refugee Talent was honoured to be a guest speaker at The Difference Incubator in the ASRC Business Connect Event. Nirary shared his aspirations of Refugee Talent, helping refugees gain meaningful employment, enabling people to use their skills and experience to be financially empowered and elevating diversity in the workplace. The ASRC Business Connect events are held on a regular basis as part of the ASRC Entrepreneurs Program. A four stage program enabling participants to gain valuable skills, and knowledge and networking to pursue their business aspirations in Australia especially those that are keen and ready to launch their own startups. 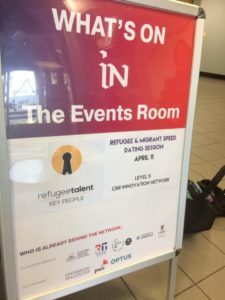 The event welcomes people seeking asylum and the program remains more committed than ever in providing them with invaluable information to improve, evolve and expand their business. Since the program’s launch in 2015, it has helped over 80 participants to regain their self-confidence and self-belief, expanded their networks within the Melbourne business community and led to the launch of 10 businesses. The Team at Refugee & Migrant Talent has expanded! Refugee Talent has experienced some incredible growth in the past 6 months, and with the launch of our sister platform Migrant Talent, we realised we needed more hands on deck to continue to provide an optimal service and support to both our candidates and employers. It was our turn to be in the shoes of our prospective employers, enthusiastic for the opportunity in finding the right people to join our team, and what better way than it is to seek talents through our own Refugee and Migrant platforms! We welcome Dana, Candidate Care – making the all-important initial contact with our candidates and Shyamolima, Marketing Coordinator – connecting us with you through our social media and the creator of our very first Refugee and Migrant Talent e-newsletter! At Refugee Talent, we celebrate World Refugee Day this June by bringing our whole team together across Australia to our office in Sydney. Did we mention that our team was growing? 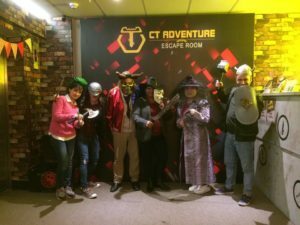 We are delighted to also announce two more members Andrew, Story Teller – captivating the nation with his narrative and Shuelin, Operations Manager – smooth operator of workflow and process management. We bring together a diverse work group, mirroring our vision of engaging global talents with businesses. “Workplace diversity is not an empty slogan, it is good business decision”. The Team at Refugee and Migrant Talent would like to say ‘Hello’ and ‘Thank you’ to all our candidates, employers, volunteers and community organisations for your continued support. Refugee Talent received the ‘‘2017 Humanitarian Award for Outstanding Achievement in Business“, presented jointly by NSW Service for the Treatment and Rehabilitation of Torture and Trauma Survivors (STARTTS) & Refugee Council of Australia at the NSW launch of Refugee Week 2017 on 16 June 2017. Refugee Week (June 18, 2017 – June 24, 2017) is run every year to raise awareness about the issues affecting refugees and celebrate positive contributions made by refugees to Australian society. Every year STARTTS holds the Humanitarian Awards to acknowledge and thank those people who have made an exceptional positive contribution towards refugee issues in NSW. Individuals and organisations in various fields that are doing outstanding work to support refugees are eligible for the Awards. Over the years, the Humanitarian Awards have honoured community leaders, youth workers, lawyers, journalists, teachers and many more – each of them making an incredible contribution to improving the lives of refugees. CONGRATULATIONS to the other Category winners!! Speed dating events for Refugees and Migrants are organised by Refugee Talent. It’s a great way for companies to come along and meet a range of talent from the refugee & migrant community in Australia, hailing from a range of industries and backgrounds. In @CBR_IN at out first Canberra speed dating event for @MigrantTalent & Refugee Talent! Candidates get the opportunity to meet a diverse network of potential employers ready to harness talent for their business. 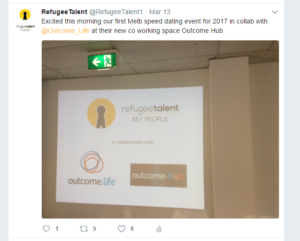 This year the Refugee Talent team has held speed dating events across Australia including Sydney, Brisbane, Melbourne, Canberra. Now, what happens at the speed dating events? Speed dating events are prearranged with an intention to discover highly skilled talent, where job seekers get to share global experience and employers identify the best match for their team. All that is required for companies to attend is to send someone from your management or HR team along to meet a range of talent with the required skillsets you are looking for. Mimicking speed dating, at an event is a group of approximately 40 candidates and 20 employers with 10 rounds of 5minutes each. Each candidate is given five minute blocks of time to woo and hopefully impress potential employers from a range of companies including Government departments, Corporates and Startups. This is a free event but places are limited, registrations required prior to the event. Organiser Nirary Dacho, himself a Syrian refugee, says they have been a great success, with lots of matches from all events. This initiative is an excellent way to connect employers with potential candidates and reach out to incredible talent, that is untapped talent in Australia. Speed dating Event for 2017 @Deloitte Parramatta this February our great MC @ChiefDisrupter. One such candidate is Rawad Kaiber from Syria “I have a degree from Damascus University in Economics. I’m trying to do my best to get work in my section” . Keep an eye out on the events page for the latest speed dating events across the country. The Techfugees Adelaide hackathon 2017 was the first of its kind in Adelaide that took place in Torrens University Australia last May. 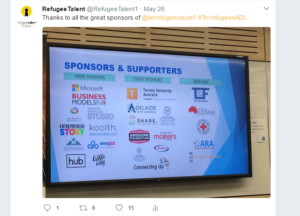 The event, organised by Techfugees Australia, brought in refugees, NGOs and technical experts into the same room, with the aim of developing new websites and apps to to solve specific problems. 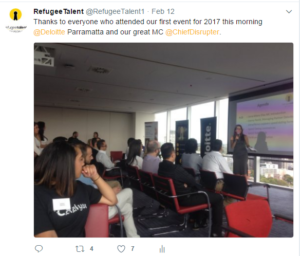 Refugee Talent actively participated in the event and shared some of their journey since they started from the first Sydney hackathon in 2015. Nirary Dacho – Co-Founder & CEO of Refugee Talent was amongst the judging panels. Techfugees is a UK founded initiative harnessing the international tech community’s skills to assist with the global refugee crisis, the Australian offshoot was set up in 2015 with the aim of helping refugees settle into the Australian community. 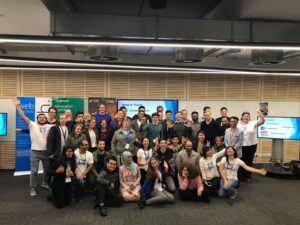 Having had four hackathons, the Adelaide meetup was an opportunity for the organisers to showcase their work that addressed problems facing immigrant communities in accessing services and capital. The participants did a great job, investing their time and talent to making a better future for refugees in Australia. It was very exciting to see how all the organising committee, volunteers, sponsors, supporters, mentors, judges and observers supported Techfugees. All of the Techfugees projects showed the diverse range of needs and talents of refugees and new immigrants. Pathways – a platform providing relevant information for recognising qualifications and education pathways for refugees. The exhausted but ecstatic participants of the Inaugural Techfugees Adelaide Hackathon!! the talents and work ethic of displaced people could well be one of the strengths for this century as well. Techfugees is a small taste of what could be done. Whereas, Refugee Talent is a digital platform connecting skilled refugees with companies offering short- and long-term job opportunities. They want to see innovation and smarts applied not just to open up economic opportunity, but also to improve the quality of life in communities across the country. Refugee Talent is proud to be partnering with many companies from large corporate, to government departments and even start-ups, bringing in diverse skills to Australia’s workforce.